In The Little Book of Bull Moves, popular author and economic advisor, Peter Schiff, takes a new look at America's bull markets of the 1920's, 1960's, and 1990's, and the bear markets that followed. Analyzing similarities and differences from both an economic and political perspective, Schiff discusses investment strategies that worked then and explains how those same conservative approaches to investing can be applied in today's market. 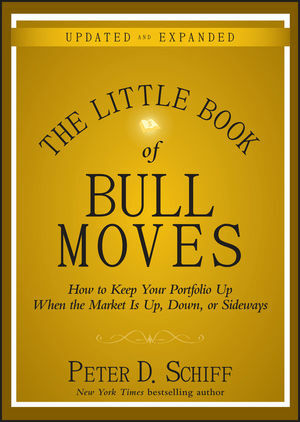 Written by a seasoned Wall Street prognosticator, The Little Book of Bull Moves shows readers how to make money under adverse market conditions by using conservative, nontraditional investment strategies. PETER D. SCHIFF is President of Euro Pacific Capital, Inc., and one of the few unbiased investment advisors to have predicted the current bear market and positioned his clients accordingly. Schiff appears frequently on Fox News, Fox Business News, CNN, CNBC, and Bloomberg TV, and has been quoted in such publications as the Wall Street Journal, Barron's, the Financial Times, and the New York Times. In 2009, he announced his candidacy for the U.S. Senate in his home state of Connecticut. He is also the author of Crash Proof and How an Economy Grows and Why It Crashes, also published by Wiley.